I’ve been using a second monitor to extend the desktop of my macbook pro for quite some time. Recently, my 19″ LCD external monitor puked, so I replaced it with a 26″ Samsung (really sweet!). With a second display much nicer than the 15″ on the macbook pro, I tend to do a lot more on the bigger one. If you depend on the menu bar and applications like Front Row, you need to get them to utilize the external display. I’ve finally figured out what you have to do! 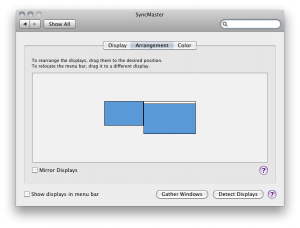 Go into the display area in System Preferences and click the Arrangement tab. 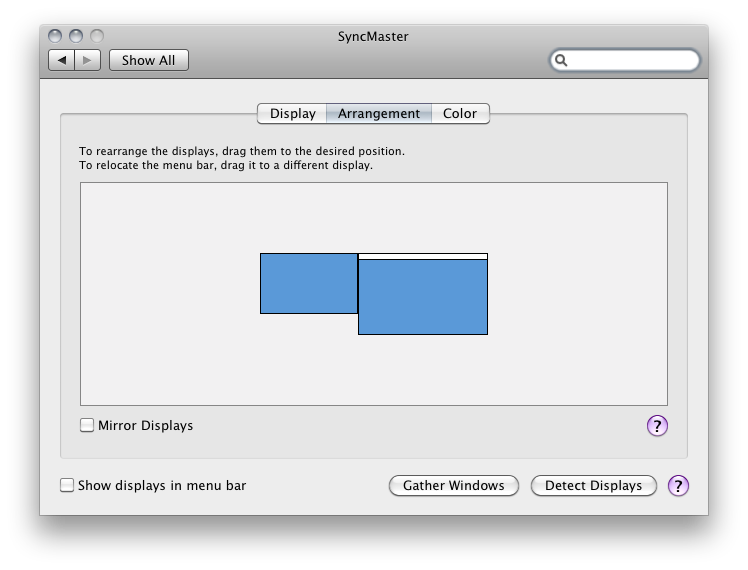 Not only can you arrange or rearrange your displays, but you can also drag the menu bar from one screen to the other! Bingo…all set! If you want a menu bar on both displays, check out SecondBar. It’s a really cool app that allows you to have a menu bar on both. Next post: It’s a happy Easter!